If you're thinking about your future career–or rethinking your current career–our list of the fastest-growing jobs is a great place to start your search. Our list includes the top 30 fastest-growing careers as projected by the U.S. Bureau of Labor Statistics (BLS). BLS job growth projections are updated every two years. While some of the careers on our list may not be right for you, they are still among the fast-growing careers in America and merit consideration. Dispensing opticians are on the front line of eye care and vision improvement. Using prescriptions from optometrists and ophthamologists, dispensing technicians help patients select eyeglasses and contact lenses that are comfortable and help them see better. Education/training requirements: Dispensing opticians usually have at least a high school diploma or GED. Even though there aren't any formal education requirements for this career, most have a least 2-year associate's degree from a community college or technical school. Some states require opticians to pass a certification exam and be licensed. Job outlook: An aging population experiencing decreased vision and the need for corrective eyewear will drive the demand for dispensing opticians. Between 2014 and 2024, employment growth in this industry is projected to hit 24%–substantially faster than the average for all other occupations. Phlebotomy is the science and practice of drawing blood from patients and transporting the blood to labs for testing, transfusion, research, or donation. Phelbotomists are medical professionals who specialize in drawing blood. Education/training requirements: To become a phlebotomists require professional certification in phlebotomy from an approved phlebotomy program. Job outlook: As our population grows older at an increasing rate and seek medical attention, hospitals, clinics, labs, and blood donor centers will hire more phlebotomists to meet demand. Between 2014 and 2024, the Bureau of Labor Statistics (BLS) projects a 25% growth in employment opportunities for phlebotomists. Nurse midwives (CNMs) are Advanced Practice Registered Nurses (APRNs) who deliver babies. They also provide prenatal care, gynecological exams and family planning services. Where there primary task is to deliver babies, nurse midwives are trained to handle various emergency situations. Education/training requirements: The first step to becoming a nurse midwife is to become a Registered Nurse (RN) by earning a Bachelor of Science in Nursing (BSN) degree and passing the NCLEX-RN exam. Becoming a nurse midwife also requires earning a Master of Science in Nursing (MSN) with a specialty in nurse midwifery from an accredited program. Job outlook: Between 2014 and 2024, the Bureau of Labor Statistics (BLS) projects the demand for nurse midwifes will grow by over 25%. Demand for nurse widwives will be driven by a growing number of women seeking to give birth at home and the ability of nurse midwifes to perform many of the functions previously reserved for medical doctors. Personal care aides help the elderly, disabled and injured, who are unable to form regular daily choirs and activities, with every day tasks such as housekeeping, homemaking, planning and preparing meals. They also provide their customers with various social support and assistance services. Education/training requirements: While there aren't any formal education requirements to become a personal care aide, most have a high school diploma or GED. The majority of personal care aides receive their training on the job. Job outlook: With an projected employment growth rate of 26% between 2014 and 2024, this industry is one of the fastest growing in the nation. Demand for personal care aides will be driven by an aging population of baby boomers who will be requiring assistance with daily living. Forensic science technicians work in the field of criminal justice and law enforcement assisting with criminal investigations. They aid investigations by collecting and analyzing evidence left at crime scenes. Typically, a forensic science technician will spend the majority of his or her time in the laboratory conducting analysis or in the field peforming crime scene investigation. Education/training requirements: The minimum requirement for becoming a forensic science technicians is a bachelor's degree in relevant field of study, such as biology, chemistry or forensic science. A master's degree in forensic science, or closely related discipline, is advantageous–and sometimes required. On-the-job training is also typical. Job outlook: Notwithstanding a growth rate of 27% between 2014 and 2024, competition for jobs will high due to growing interest in this job and it being a relatively small and specialized occupation. Candidates with a master's degree, or other specialized training, will have the best employment opportunities. Web developers and designers design and develop websites that are aesthetically pleasing, functional and that support specific business, operational and marketing objectives. Web developers often are in charge of all aspects of website creation and maintenance including design, programming and marketing. Education/training requirements: Web designers and developers are not required to complete any formal training or education–but most do. An associate's degree in web design or development will prepare you of entry-level positions as a web developer. However, most web developers will have advanced technical training in both graphic design and programming from a technical school or college. Job outlook: The growing popularity of ecommerce and increase in mobile device usage are the key drivers of demand in web development. Between 2014 and 2024 the demand for qualified web developers is projected to increase by 27%. Occupational therapists help injured, ill and disabled individuals regain their ability function and carry out normal everyday activities. Their primary objective is to help their patients develop the skills required to work and have a fulfilling life. Education/training requirements: Occupational therapists usually earn a 4-year bachelor's degree followed by a 2-year master's degree in occupational therapy. Upon completion of their degree, occupational therapists are required to be licensed in the state where they practice. Job outlook: With a projected growth rate of 27% between 2014 and 2024, occupational therapy is one of the fastest growing career fields in the United States. Demand for occupational therapists will be driven by an increase in various illnesses and disabilities associated with a growing population of aging and ailing Americans. Optometrists, sometimes referred as "eye doctors", specialize in eye care, eye health and the visual system. They diagnose eye conditions, problems, diseases, and other disorders and develop treatment programs to help patients maintain and improve their eye health and vision. Education/training requirements: Optometrists must complete a bachelor's degree before going on to complete a Doctor of Optometry (O.D.) degree from an approved program. Following degree completion, candidates must pass a national exam and obtain a licence to practice optometry in their state. Altogether, it typically requires eight years of post-secondary study to become an optometrist. Job outlook: Between 2014 and 2024 employment of optometrists is projected to grwo by 27%. An aging population of baby boomers and elderly experienced degenerative conditions of they eyes will drive demand for optometrists. Hearing aid specialists help customers and patients find the right hearing aids. The administer hearing tests, analyze test results and make recommendations to patients. They also take ear impressions and make ear molds to help design hearing aids. Education/training requirements: Hearing aid specialists are not licensed Audiologists or doctors. Consequently, education requirements for becoming a hearing aid specialists are less stringent and demanding. A bachelor's degree and/or on-the-job training are typically the minimum requirement for becoming a hearing aid specialist. Job outlook: The projected employment growth rate for hearing aid specialists between 2014 and 2024 is 27%, substantially faster than the average for all other occupations. Demand for hearing aid specialists will be driven by a growing population of elderly patients who will be experiencing hearing loss. Audiologists are doctors that specialize in diagnosing and treating conditions relating to the ears–including hearing loss, issues with equilibrium and virtigo, tinnitus, and other disorders. Audiologists will often specialize in treating children or the elderly. Education/training requirements: In the United States, Audiologist are required to complete a bachelor's degree and then a doctoral degree in audiology (Au.D.). Together a bachelor's degree and the Au.D. will take about eight years to complete. Job outlook: Employment opportunities for audiologists are expected to be plentiful through 2024. Demand for this occupations will be driven an aging poplution that will be experiencing hearing loss and consequently the services of audiologists. Interpreters and translators translate, in the spoken language or writing, one language into another. Translators also work in sign language for the hearing impaired. Typically, interpreters work only with spoken language and translators work with written communication. Education/training requirements: The minimum requirement to become an interpreter or translator is fluency in at least two language–English and a foreign language. A bachelor's degree is not always required but preferred by employers. Formal training in English and the other language (or professional certification) is a big plus. Job-specific training is often required. Job outlook: With a projected growth rate of 29% between 2014 and 2024, intepretation and translation is one of the fastest growing career fields. The primary driver of demand for interpreters and translators is growing number of non-English-speaking people migrating to the United States and increasing globalization. Genetics counseling is a process through which individuals or families at risk of inherited conditions, genetic disorders, or birth defects are able to assess the probability of developing or transmitting the disorder to their children. Genetic counselors provide information, counseling, support and other healthcare services to individuals and families concerned with the risk of genetic disorders. Education/training requirements: To become a genetic counselor requires a master's degree in genetics or genetics counseling. Most states also require genetics counselors to become board certified before they can practice. Job outlook: A growing awareness of the risks associated with genetic conditions that can be inherited, innovations in technology, and advanced in genomics will drive demand for the services of genetic counselors through 2014. Between 2014 and 2024 this career is projected to experience a 29% grow in employment. Cartographers and photogrammetrists are geographers of sorts who develop and update maps and charts using geographic information they college, measure and analyze. The maps and charts they developed are used by educational institutions, cities, and regional planning organizations. Education/training requirements: The typical pathway to becoming a cartographer or photogrammetrist is earning a bachelor's degree in geography, cartography, geomatics, or surveying. Some states have licensing requirements for cartographers and photogrammetrists. Job outlook: Employment opportunities for cartographers and photogrammetrists are projected to grow by 29% over the next decade. The growing demand for cartographers and photogrammetrists is a result of government agencies increased use of maps. Physician assistants work under the supervision of a licensed physician or surgeon. In some states they are able to work independently. They examine patients, diagnose ailments, and development treatment plans. Physician assistants work in all areas of medicine, including family medicine, primary care, surgery, emergency medicine, and psychiatry. Education/training requirements: Complete a 2-year physicians assistant program offered at an accredited community college or vocational school before passinng the national licensing examination. Job outlook: A growing shortage of physicians, and need to decrease healthcare costs, is leading to an increase in demand for physicians assistants at hospital and healthcare clinics–especially in inner cities and rural areas. Personal financial advisors assist people with developing financial strategies for retirement and managing their finances. They consult their clients on matters relating to investments, insurance products, saving for college, tax preparation, estate planning, mortgages and retirement. Education/training requirements: Personal financial advisors are typically required to have a bachelor's degree–preferrable in a relevant field of study. Earning a master's degree or MBA will help set personal financial advisors apart from their competition. However, some financial advisors enter the field through on-the-job training. Job outlook: As more and more baby boomers reach the age of retirement, they'll need sound financial planning and money management services from a personal financial advisor to ensure their funds last them the rest of their lives. Longer lifespans, leading to longer retirement periods, will also contribute to the demand for the services provided by personal financial advisors. Operations research analyst are expert problem solvers that employ mathematical, statistical and analytical methods to corporations, organizations and key decision makers solve complex problems so they can make informed decisions. Operations research analysts work in various fields including business, healthcare, logistics and more. Education/training requirements: Entry-level positions in operations research analysis can be obtained with a 4-year bachelor's degree in a relevant field of study. However, most employers are seeking to hire candidates with a master's degree or Ph.D.
Job outlook: With a projected employment growth rate of 30% through 2024, employment prospects for Operations Research Analysts are quite positive. Demand for these professionals will be driven by advances in technology and corporations seeking to save money and increase operational efficiency. Nurse practitioners, including nurse midwives and nurse anesthetists, are advanced practive registered nurses (APRNs), provide and coordinate advanced primary and specialty healthcare to patients. APRNs may work under the supervision of a licensed doctor or independently. Their scope of practice varies from state to state. Education/training requirements: Advanced practice registered nurses must earn a Bachelor of Science in Nursing (BSN) followed by a Master of Science in Nursing (MSN). Students studying to become a APRN must pick a nursing speciality, become licensed in their state and pass a national certification exam. Job outlook: Employment prospects for nurse practitioners couldn't be better. Due to recent healthcare legislation, a growing population of elderly people, an increased focus on providing preventive car and fewer doctore entering the medical profession, demand for nurse practitioners will strong through 2014. Ambulance drivers and attentants are primarily responsible for the transportion of injured, sick or convalenscent people to hospitals and other primary and emergency care facilities. They also help transport people to and from the ambulance itself so they must be in descent physical shape. Education/training requirements: The typical entry-level educational requirement to become an ambulance driver is a high school diploma or GED. Most training to become an abulance driver or attendant is provided on the job. Job outlook: As is the case with other professions that are pegged to growth in the healthcare industry, the job outlook for ambulance drivers and attendants is bright. At a projected growth rate of 33% through 2024, ambulance driver is one of the fastest growing jobs in the nation. Statisticians collect data and analyze it using statistical methods. They use their statistical knowledge and skill to help organizations solve complex, real-world problems in healthcare, business, engineering and various other fields. Education/training requirements: Becoming a statistician isn't a cake walk. It typically requires a master's degree or Ph.D. in statistics, mathematics, or another closely related quantitative field of study. There are however a few entry-level career positions for those with a bachelor's degree in statistics. Job outlook: The use of statistical analysis to solve business problems and make more informed decisions is growing. Demand for skilled statisticians is projected to grow by 34% through 2024–much faster than the average for all other occupations. After a physician has treated a patient they often prescribe physical therapy. Physical therapists help people who have fallen ill or been injured in an accident regain movement and manage pain. They are an integral component of a comprehensive rehabilitation plan for individuals who have sustained injuries, are afflicted with illness, or have some other chronic condition. Education/training requirements: Becoming a physical therapist require a lot of schooling. Physical therapists are required to complete a bachler's degree followed by a Doctor of Physical Therapy (DPT) degree from an accredited program. Once they've complete their degree, aspiring physical therapists must pass state exam to become licensed. Job outlook: With an employment growth rate of 34% through 2024, physical therapy is one of the fastest growing jobs in the nation. Demand for physical therapists will be spurred by a growin population of elderly, who are living longer and want to maintain an active life style. Many new physical therapists will also be need to treat a growing number of people with chronic heatlh conditions. Home health aides help individuals suffering from chronic conditions, illness and disability function in their daily lives. More often than not, home health aides assist older adults who can no longer carry out daily activities on their own. Responsibilities of a home health aide are regulated on a state level. In some states, home health aides can administer medication and check vital signs when supervized by a registered nurse. Education/training requirements: There are no formal education requirements for becoming a home health aide, although most have graduated from high school. However, those working in hospice agencies or certified home health are often required to become certified. Job outlook: An aging population of baby boomers and elderly over the next decade will drive additional need for healthcare and health support services including and spur demand for more home health aides. Commerical divers use scuba gear to work underwater to install, remove, inspect and repair equipment, machines and structures. They also conduct experiments, perform tests, rig and detinate explosives and monitor marine life. Equipment they use include hammers, drills, welding equipment and various other hand tools. Education/training requirements: Scuba certification, advanced dive training and certification, and on-the-job training. Job outlook: Given the specialized and demanding nature of commercial diving there isn't a lot of competition for this position. Currently, there are about 2,400 commercial divers in the United States. Given the additional risk commercial divers face, they usually earn more that other installation, construction and repair workers. Demand for commercial divers will continue to grow due corporations requiring more underwater repair, installation and maintenance. Physical therapist assistants and physical therapist aides assisted patients who are recovering from physical injury or illness. Specifically they help rehabilitate by improving body movement, flexibility, strength and pain management. Physical therapist assistants and aides work under the supervision of a licensed physical therapist. Education/training requirements: Physical therapist assistants are required to have an associate's degree in from an accredited physical therapist assistant program. Physical therapist aides typically only need a high school diploma (or GED) and received on-the-job training. Job outlook: Over the next decade employment of physical therapist assistants and aids is projected to grow by 40%–much faster than the average for all other occupations. Employment growth will be due to the overall growth in demand for physical therapy services, driven by growing healthcare needs of an aging population of baby boomers. As their name suggests, physical therapist assistants and aides help physical therapists as they assist patients recovering from illness and injury. Under the supervision of a licensed physical therapist, physical therapist assistants and aids help injured people regain body movement and manage pain. Education/training requirements: To become a physical therapist assistant requires a 2-year associate's degree in physical therapy assisting from an accredited program. All states not required physical therapy assistants to obtain state licensure or certification. Physical therapist aids are not required to be licensed or certified. They typically only require a high school diploma or GED. Job outlook: A growing need for healthcare services by an aging population of people experiencing chronic illness and disabilities is spurring the demand for physical therapy services. As the demand for physical therapy grows so does the demand for physical therapy assistants and aides. Occupational therapy assistants and aides help disabled, injured and recovering patients improve or reacquire the life skills they need for daily living and work. Occupational therapy assistants and aides typically work on the supervision of a licensed occupational therapist. Education/training requirements: The minimum educational requirement for becoming an occupational therapy assistant or aide is a 2-year associate's degree from an accredited occupational therapy assistant program. These programs are offered at community colleges and technical schools throughout the United States. Job outlook: At projected growth rate of 43% through 2024, occupational therapy assisting is one of the fastest growing career fields in the United States. The demand for occupational therapy assistants will be driven in large part by aging babyboomers and the health risks they face. Wind turbines are large mechanical devices that look like windmills. These devices harness the power of wind energy and convert it into electricity. 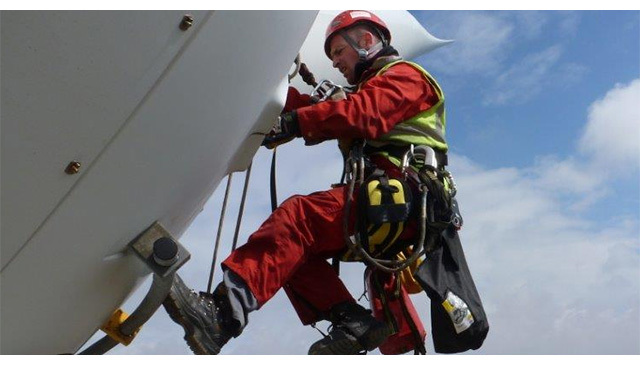 Wind turbine service technicians, also referred to as windtechs, install, inspect, repair and maintain wind turbines. Education/training requirements: The minimum requirement to become a Windtech is typically a 2-year associate's degree in wind turbine technology from an accredited technical school or community college. Job outlook: The job outlook for Wind Turbine Technicians could not be better. Between 2014 and 2024 the industry is expected to more than double in size. Over this ten year period the industry will add over 4,800 new jobs.